You've Found A Stray Cat -- Now What Will You Do? Home / You’ve Found A Stray Cat — Now What Will You Do? Sometimes the best cats are the ones who find you. They’re the ones who follow you home, show up in your backyard or suddenly appear in your office parking lot. But there are some things to think about when you’ve found a stray cat and are trying to decide if you were meant to be together for life. The Missing Pet Partnership would urge you to “think lost, not stray.” The vast majority of cats found on the street are not dumped, abandoned or abused. They’re simply lost and want nothing more than to go home to the people who love them and are probably searching for them. It’s also possible the cat is someone’s indoor/outdoor or outdoor cat and is just stopping by your place for a visit. If you’ve found a stray cat, make sure she doesn’t already have a home before you take her in. An easy first step is to put a breakaway collar on her with a note, “Does this cat need a home?” Add your phone number or email address. If the cat lives nearby, you’re sure to get a call or note. Call in a found report to your animal control agency. Don’t take the cat there! Just call in the report. Take the cat to a vet to be scanned for a microchip. There shouldn’t be any charge for this. Post fliers in the exact location where you found the cat or in your neighborhood and the neighborhoods adjoining yours. Cats can travel a long distance when lost and confused. Include a picture of the cat, but leave out some details about her personality or appearance. You want anyone who contacts you to be able to describe the cat and all her eccentricities. Check the lost cat listings on Craig’s List, PetFinder.com and the lost and found pets pages for your area on Facebook. Post her as a found cat on those websites, too. On Craig’s List, post her in both the Pets and Lost and Found sections. If you’ve found a stray cat, don’t jump to conclusions. Cats who are lost and have been outside for a long time can be matted, covered with fleas and emaciated. A cat who’s in bad shape hasn’t necessarily been dumped or abandoned. More likely, she’s just lost and has been on her own for a very long time. Try not to impose your beliefs on other people or their cats. Maybe you think cats should live strictly indoors. 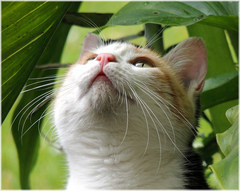 But many cats prefer the indoor/outdoor lifestyle or want to live completely outside. “Rescuing” a cat because you think she shouldn’t be outdoors isn’t fair to her or her family and can cause no end to heartache for both. There’s nothing more heartbreaking than losing a cat. Many people search for their lost cats for months or even years. If you find a stray cat, please assume she’s lost and make a real effort to find her family. That will be a true act of kindness from one cat lover to another. We all have the urge to rescue an animal in need. But with rescue comes some responsibility. If you’ve found a stray cat, and you’re not prepared to keep her if you can’t find a home for her, it might be best to leave her where she is until you find a safe place for her to go. If she needs medical care, be prepared to pay for it. 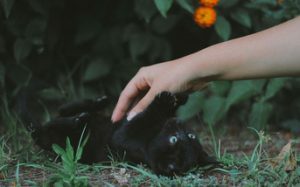 Very few rescue groups have money to donate or loan for veterinary care, and very few vets are willing to treat a sick or injured cat for free. In most jurisdictions, taking a stray cat to a shelter is almost always a death sentence, especially if the cat is sick or injured. Not all no-kill rescues are willing to take strays or “owner give-ups,” and it might be hard to find one that has room. If you do give the cat to a no-kill rescue, find out where she’ll be living. Will she be in a cage? In a foster home? And if she goes to a foster home, how many other cats will be in the home? Will she have run of the whole house, or will she be confined to a room or bathroom? Think about whether you’ll be comfortable with her living arrangements and, more important, how she’ll feel about them before you give her to the rescue. Taking in a stray cat is more than an act of kindness. It’s a big responsibility and major commitment. Giving some thought to whether you want to make that commitment is only fair to you and the cat. Feral cats are not stray or homeless. Their homes are the woods behind your house, the parking lot where you work, the warehouse down the street. While their living conditions may seem harsh to you, they’re used to the woods and parking lots, and that’s where they want to stay. Mother cats with kittens tug hardest at our heartstrings. But remember that while feral cats look exactly like our house cats, they have very little in common. They’re domestic cats who have returned to their wild state. While that mom and her babies will benefit from some human assistance, they don’t want to be rescued. And the last place a feral mother and her kittens belong is a shelter where they will most likely be killed. The kindest thing you can do for feral cats is get them neutered/spayed, vaccinated and ear tipped and return them to their outdoor home. Feed them every day, and give them shelters so they’ll be warm when the weather turns cold and dry when it rains. They’ll appreciate your kindness and will probably live long, happy lives. If you must relocate them, look for one barn home for all of them so they can stay together. 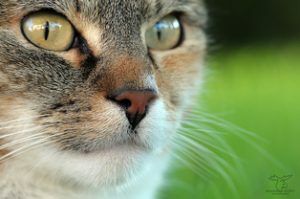 Cats form strong bonds with their family members and friends, and it’s always best to keep feral cat colonies together.